Terry O'Brien pays homage to volunteers with this American Red Cross motif amulet bag. In the colors of red, white, and blue, this piece has a bold red center form with a red cross in the center of a white field, along with matching designs along the strap. The strap is 26” long. 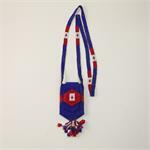 At the base of the “v” shaped amulet, is a fringe decorated with larger beads in the same colors. 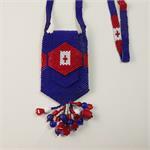 Terry O'Brien makes her pouch necklaces from beads that are stitched together with no fabric backing. Using a flat gourd stitch known as a "peyote stitch", the beads are sewn one row at a time and stitched into every other bead on the preceding row. This allows the beads to stack up like bricks, fitting smoothly together to create an even, supple layer of beads. 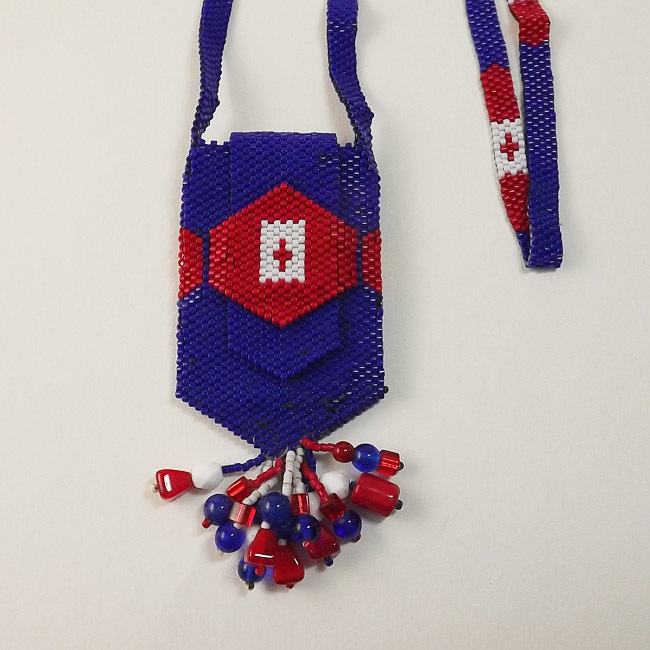 The necklace portion of a beaded pouch is not made separately or attached, but rather sewn as a continuous piece from the pouch. 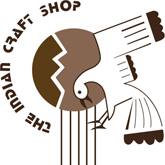 Length of pouch with fringe 3 1/2", width 1 3/4"; Total hanging length: 16"